[one_half last=”no” spacing=”yes” background_color=”” background_image=”” background_repeat=”no-repeat” background_position=”left top” border_size=”0px” border_color=”” border_style=”” padding=”” class=”” id=””] What is robotic surgery? Robotic surgery is a form of laparoscopy. Laparoscopy is minimally invasive surgery, usually performed in an outpatient setting. Small incisions about a half inch each are made in the abdomen that allows a surgeon to place a laparoscope (lighted camera) and surgical instruments through surgical incisions below the belly button. The laparoscope then goes inside the abdomen or pelvis in order to perform surgery. In traditional laparoscopy, a surgeon holds those instruments and directly places them through the incisions. The instruments can move forward and backward and can be opened and closed. 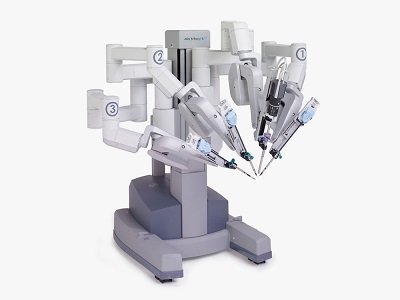 In robotic surgery, the same incisions are made and instruments are placed, but the instruments are usually held in place by “robotic arms.” The surgeon controls the robotic arms and instruments from a control center or “console” several feet away from the patient but in the same operating room. The console can also be controlled from a remote location. What are the advantages of robotic surgery compared to traditional laparoscopy? 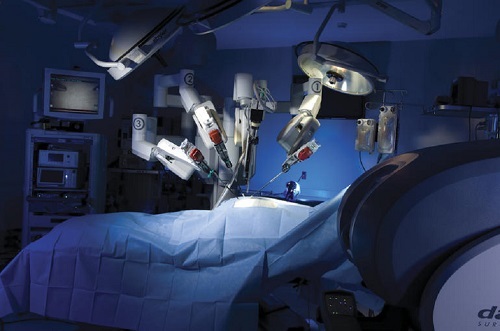 Compared to traditional laparoscopy, robotic surgery has several advantages. First of all, the console uses high-definition cameras so the surgeon’s view inside the abdomen and pelvis is clearer. Also, the surgeon’s depth perception is better during surgery because the view is 3-dimensional as opposed to traditional laparoscopy, which is 2-dimensional. Control of the instruments in robotic surgery is better than in traditional laparoscopy because the instruments in robotic surgery can move in any direction that the surgeon’s hand can move. This better control means the surgeon can perform more precise movements and speed up or slow down hand movements, and it allows for easy suturing (sewing) and knot tying. What are the advantages of robotic surgery compared to laparotomy (open incision)? Compared to laparotomy (open incision), robotic surgery is less invasive. During robotic surgery, the incisions are smaller and healing occurs in 1 to 2 weeks as opposed to 4 to 6 weeks for a laparotomy. Also during robotic laparoscopy, the 3-dimensional high-definition camera gives the surgeon a better overall view of the surgical field and the back of the pelvis, and allows for more magnification than only the surgeon’s eyes during a laparotomy. [/one_half][one_half last=”yes” spacing=”yes” background_color=”” background_image=”” background_repeat=”no-repeat” background_position=”left top” border_size=”0px” border_color=”” border_style=”solid” padding=”” class=”” id=””] Are there any disadvantages of robotic surgery? During robotic surgery, the surgeon has the less tactile feel of the tissue. When more than one robotic arm is used, movement can be limited. 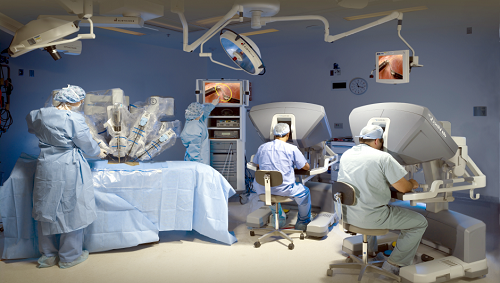 Since the surgeon controls the robotic arms, there is less opportunity for surgical assistants to help during surgery. Also, the time that it takes to perform robotic surgery can be longer than traditional laparoscopy or laparotomy. Because of this long time, the time under anesthesia may be increased, which can lead to more potential risk for the patient. What are the most common surgical procedures performed by robotic surgery? Robotic surgery in gynecology is often used to perform hysterectomy (removal of the uterus), myomectomy (removal of fibroids), incontinence (inability to hold urine) procedures, tubal reconstruction procedures (repair of the fallopian tubes), removal of endometriosis (growth of tissue that normally lines the inside of the uterus outside of the uterus in the pelvic cavity), removal of pelvic masses, and oncologic (cancer) procedures. In particular, the improved suturing and knot tying allows for removal of small or large fibroids that would otherwise require a laparotomy. The improved accuracy of instruments allows for the removal of lymph nodes for cancer treatment and of scar tissue from endometriosis. Theoretically, robotic surgery can be performed in place of any laparoscopy and in place of many laparotomies. Is robotic surgery right for everyone? No. Your doctor must determine whether you are a good candidate for robotic surgery. This decision is based on the planned procedure, your surgical history, the condition that needs treatment, the shape of your pelvis, and the experience of your surgeon. Even when a patient is a good candidate for robotic surgery, it may not be possible to complete the surgery robotically for one of several reasons. It is important to make an individualized decision about any surgery you might need.